Do you take to heart the negative comments of others? Do you believe the negative things that people have said to you? Have you not done things because people have told you that you couldn't or shouldn't? (Nothing life-threatening of course). This morning I was reflecting on some instances in my adulthood when I was told by others to not do something. In my strong-will to prove the wrong I ignored their advice and good things came out of my perserverance. Don't let people stop you from achieving your God given destiny. 'You are no good at teaching. Go and find another job.' My first principal told me this. She constantly criticised me and failed my probation. She destroyed my self-confidence and she then left the school. I decided that this woman was wrong because I thought teaching was what God wanted me to be doing... the children in my class loved me... so I set about proving her wrong. I worked hard on my behaviour management skills and self-confidence (I was very shy). The next principal who came along believed in me and nurtured me....here I am 24 years later still teaching, helping many children to learn and showing them the love of Jesus. 'Don't leave your husband....you may never find anyone else.' This was the advice by my marriage counsellor when I was suicidal from the domestic abuse I was under. I again ignored this advice. I had made a very poor choice marrying him. I decided to make a better choice by leaving. And if that meant that I was to be alone for the rest of my life that that would be better then where I was. Again God came through for me and blessed me with a new wonderful husband and three gorgeous children. 'Don't meet Joe. He might be an axe murderer.' I met my new husband on the internet in a chat room in the late 1990s. He was in the USA. At this time there was a lot of suspicions about chatroom romances. When he said he was coming out to Australia to meet me there were many people who were negative and told me not to meet him. But again God was already there working in the situation. I have been happily married to Joe now for 12 years. 'You have no right to have children when you know you have a 50/50 chance of passing on the Crouzon Syndrome gene. It is selfish of you to deliberately pass on a gene that probably means that the children will need painful operations.' Oh yes I have heard this, and seen it written under my youtube videos. I have asked my children and they have told me that they are happy that they were born.... They are not resentful of the fact that they have Crouzons...it is just a part of them... and they have seen many other children who have worse disabilities then they do. They are happy, intelligent, fun-loving, self-confident children...they are a blessing. God made these children the way they are meant to be. 'I would never put anything personal on the Internet. You never know who will read it!' 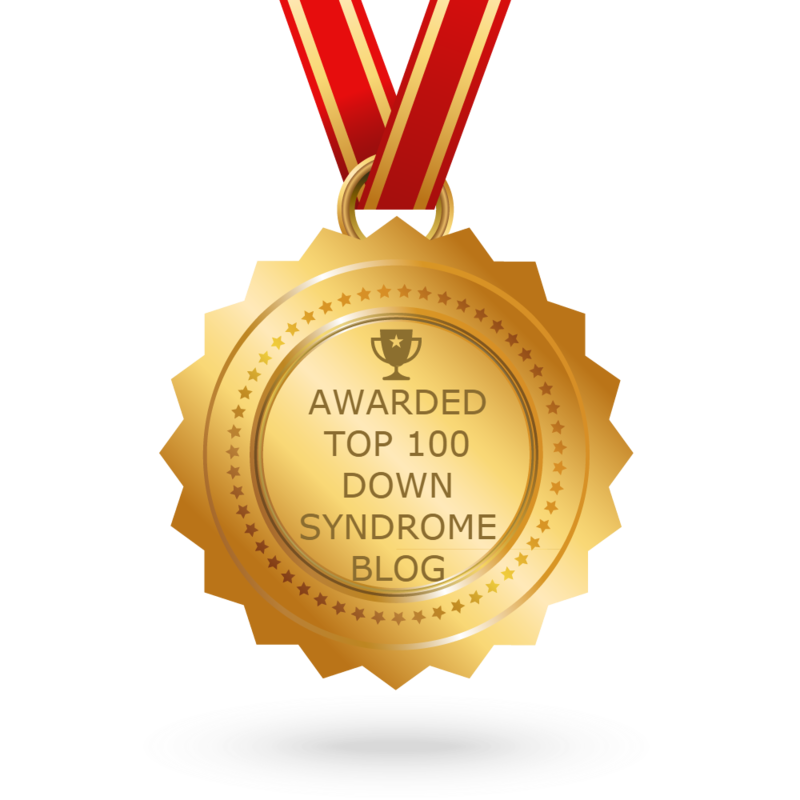 In the early days of the internet I made a website about my life with Crouzon syndrome - it is still floating around in cyberspace. If I had listened to what other people said, then I would not have made that website, or the youtube videos, or the International Crouzon Syndrome Support Group on Facebook, or even this blog. If I had not done any of these then there would be a lot of people in the world who would be less educated and many people around the world feeling very isolated who are not isolated now because of me. I have been able to help so many people. Another one of God's purposes for my life. 'Oh your child has Down syndrome. I am so sorry.' This was engrained in my psyche. I believed that Down syndrome was a really terrible condition to be born with which is why I became so depressed when she was diagnosed. But you know what? It isn't! Yes Jess has her challenges, but what child doesn't? Jess has blessed our family and she has blessed so many other people already in her short life. I still remember when Melissa was at the doctor's waiting room and there was a depressed teenager there - her Mum said she never smiled. Jess went up to the girl and was entertaining her. The girl smiled! The mother was amazed. Jess is meant to be on earth and God has a purpose for her life. My kids made up a quick dance before bedtime tonight - here it is. They are awesome. Delete the negative comments out of your mind. Focus on the positive and press on to doing the things that God wants you to do. Nick was always a small baby and toddler. In both height and weight. The paediatrician had even mentioned in passing, growth hormones, in Nick's future if he did not grow enough. We started to notice that he was complaining nightly of a sore tummy. We put this down to anxiety. We also noticed that he was having daily diarrhoea. He did not complain about this so we think he thought it was normal. He has told us that it started in Prep when he was 5 years old. We also noticed that Nick was getting a pot belly and his ribs were showing and even his vp shunt line stood out. We were feeding him plenty of food and he never went hungry so we didn't understand what was happening. Low and behold to our bewilderment Nick looked like this because he was malnourished. He had an allergy to gluten and wasn't absorbing any nutrients from food that contained gluten (wheat, rye, oats, barley). When we looked in our cupboards/fridge at the foods he was eating, and we read the ingredients on the packets, the majority contained gluten. The children had their regular paediatrician appointment and when it was Nick's turn we explained about his constant sore tummy complaints and his diarrhoea. The doctor looked at his exposed ribs (and vp shunt line) and his pot belly..and of course his lack of growth. The first thought was a lactose intolerance and we were told to take him off dairy. This did not change any of his symptoms. He also had to have a blood test which indicated that he may have Coeliac Disease. He was booked in to have a biopsy of his small intestine and the gastrologist would have a look to see what was going on. The operation confirmed that yes Nick did have Coeliac Disease. The villae were lying down and black. He would have to go on a strict gluten free diet straight away. We saw the dietitian at the hospital and we contacted the Coeliac Society who supplied us with resources. We had a friend a church whose son who was the same age as Nick, also had Coeliac, so they were a fantastic support and source of information. This was another whole new world of learning. Scary at first. And also for Nick to come to terms with. It has taken him about 1 1/2 years to be truly comfortable with not being able to eat the food that most kids take for granted. 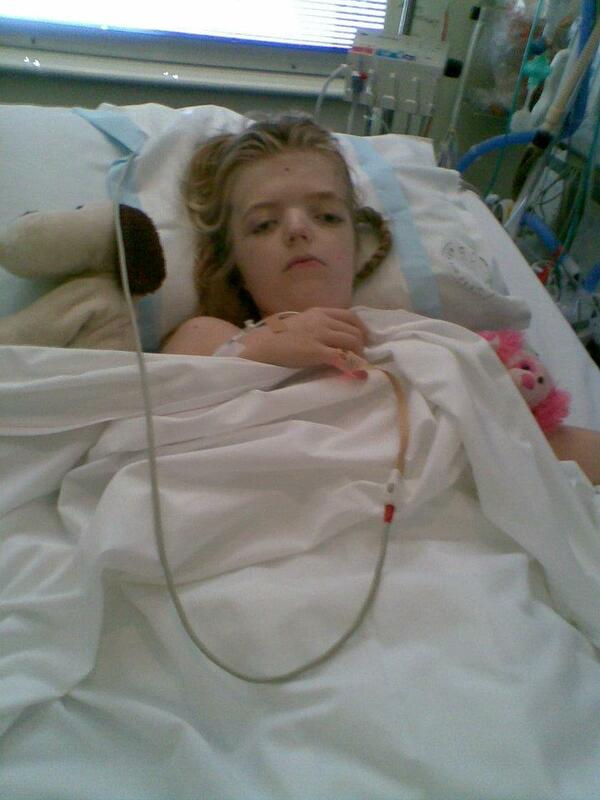 Before Melissa had her mid-face advancement done she had had a CT scan of her skull and neck. A shadow showed on the top of her spine in the scan. After the mid-face advancement was finished Melissa was sent for a MRI to investigate this shadow. The results were that Melissa had a chiari malformation and a pocket of fluid in her spine called a syrinx. The chiari malformation is where the brain is growing down into the spinal column blocking off the flow of the cerebrospinal fluid. Melissa was referred to a neurologist at the Mater to be assessed. The neurologist examined Melissa and said that she had quick refluxes which meant the chiari malformation and syrinx was impacting on her functions. The neurologist decided that she would monitor Melissa and if her symptoms worsened then she would be referred to the neurosurgeon. Over time Melissa began to notice more symptoms - she would get tingling in her hands and she would have 'drop attacks' where her legs would hurt and fall out from beaneath her, with her landing on the ground. She also began to have headaches. As we were told would happen, the neurologist referred Melissa to her neurosurgeon. The neurosurgeon requested a MRI with dye x 2 so he could see exactly what was happening. Surgery was planned and a date set. I had heard of 'chiari malformation' on the yahoo email group I was on. I also googled it to learn more. What I googled was thankfully the same as what the neurosurgeon told us he was going to do. He was going to shave off part of the inside of the top vertebrae and if need be apply a duraplasty to the brain in the gap. If need be he would also put in a shunt to drain the syrinx. Melissa was admitted after having her MRI which we did not know was happening. I had to have a friend take Nick and I to the hospital after school. The plan was to have the shunt revision the next morning. Melissa fasted from 2am. The next morning the at 9.45am the neurosurgeon arrived in the ward and told me that he would not be operating until the eye clinic had examined her eyes. They were supposed to have seen her earlier in the morning but no one was available. Melissa ended up having her eyes checked at 2pm - she was still fasting and crying from hunger. It was after 3pm when we heard that the op had been cancelled because there was no pressure in her eyes. She could finally eat. We then could not leave the hospital. We had to wait for the physio to come and assess her and for ENT to come and assess her. They arrived the next day. The neurologist also came and documented Melissa's new symptoms. The next day we were about to go home when we were told not to go home...that the neurosurgeon wanted to come and see us the next day. So we waited and waited and waited. Eventually we were told that the neurosurgeon would not be coming to see us and to go home. I did find this frustrating but I've been coming to the hospital long enough to know that things happen and doctors can not always come when they say they are going to. The neurosurgeon's registrar rang us to explain what had happened - the neurosurgeon had been caught up in theatre. Melissa would be booked in to have the chiari malformation repaired. The operation went ahead. It took about 4 hours and she went to PICU afterwards. The neurosurgeon took part of the inside of the top neck vertebrae and a 2cm x 3cm piece of the lower skullbone. He then had to patch the exposed spinal cord with a duraplasty. The decision was made to not put a shunt in the syrinx (pocket of fluid) - to let the body readjust on its own. 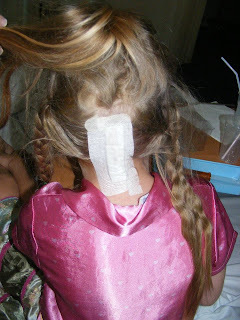 Melissa had a lot of pain with this surgery and a very stiff neck afterwards. We were told that the pain was mainly due to the muscles etc. being moved more than the removal of the bone. She continued to have some symptoms post-op. Another MRI was performed and it showed that the syrinx was still there but it was smaller. Time would tell whether more surgery would be needed. I had been part of the Yahoo Email Support Group for a number of years. Finding that page was like finding my home. After all the years of feeling isolated and misunderstood I finally found a group where there were other people just like me! I decided in 2010 to begin a support group on Facebook. I didn't want to compete with the Yahoo group, just to add another way of people to connect. I initially began advertising to people in Australia to form an Australian group but I was contacted by Tom Head in the UK who asked me to make it international which I did. The group has grown and been able to connect people from all over the world. People no longer feel alone. We currently have over 400 members. I pray that the group will continue to grow and that we can encourage and support each other...and to also raise awareness that Crouzon syndrome exists. When we went for Melissa's annual meeting with her team of specialists in January 2010 the plastic surgeon decided that it was time to do Melissa's mid-face advancement. The decision was based on the fact that the suction of the cpap mask was not allowing any growth of the mid-face area and Melissa's face was becoming more and more concave. The cpap machine had to go. We were told that there were two options available. The mid-face advancement, called a Lefort III, could be done using the RED (Rigid External Distraction using a halo) or by Internal Distraction (using screws which show above the ears). We had seen a child at the hospital with the internal distractors, and we had seen photos on the internet of the RED. The plastic surgeon decided on the RED because from his research the RED allowed more precise movement of the bones in more than one direction (the bone can only go forwards with the internal distractors). Luckily I had been on an internet support group and had heard of this surgery and knew basically what was involved and what we needed to prepare. We bought clothes with buttons, a blender for mashing up food, a very small toothbrush, lots of toys, puzzles, craft supplies, dvds etc. It ended up being a very long 4 month process. It was hard to explain to Melissa what would be happening because all we had was the Internet photo. We were going into an unknown world (this is the major reason why I made the youtube video - to help others going through the same process). On the morning of the op Melissa had to be at the hospital by 7 am and was fasting. It was a long 6 hour wait until it was her turn. We saw children come and children go. The afternoon patients were coming in when Melissa was finally called. We found out that they had been waiting on a PICU bed to be freed up before doing the operation. Melissa found the process very hard to deal with. She wanted the RED taken off, she cried from the pain associated with the stretching of the skin and muscles. We became very worried about Melissa's state of mind as we could see her spiralling into severe depression.We took her to see the Child & Youth Mental Health Service at the hospital. Fortunately I had made contact with them before leaving hospital as she was very teary in hospital and because of her history of depression, I was concerned that it was beginning again. So they knew the situation and were very supportive. I will always remember the doctor showing Melissa a deck of cards with pictures of teddies on them. Each of the teddybears had a face showing emotions. Melissa was asked to take out all the cards that showed how she felt. Every card she chose was sad...not one happy bear. My heart broke. The doctor worked with Melissa helping her to cope with her feelings and to get through the process. Funnily enough she doesn't remember feeling depressed or seeing the doctor a CYMHS. Her mind seems to have blanked it out. Once the RED came off we had a different girl living in our house! My husband and myself would catch ourselves staring at the 'new' Melissa. She too had to get used to her new face. The day she had the RED removed she told us that she wanted her old face back....she doesn't say that anymore. In the months leading up to the operation Melissa was experiencing more social problems at school. She wanted to fit in and to be liked. As a result she made some poor choices and found herself on detention on a couple of occasions. Soon after the operation a butterfly emerged. We noticed that Melissa started to hold her head up high, she pulled her hair back from her face, she become ambitious and self-confident. She would also stand up to her friends. Another plus was that she no longer needed her glasses or her cpap machine. The surgery had been a major success. The plastic surgeon has since told us that Melissa has had one of his best results - thank you God. From our reading we knew that Jess needed to be stimulated - over stimulated in many regards. spend his days reading and reading and reading to her...and looking at pictures in books and talking about them to her. Books, books and more books. sing nursery rhymes and action songs to her. encourage Jess to crawl, climb and then to walk. talk to her and play with her. use Makaton sign language with her. expose her to lots of bright colours, different sounds, different textures. let her watch the kids' educational tv shows as well. Days were spent inputting into her brain. Jess's first word was 'hi'. She walked alone at 19 months. Jess held a cup and drank by herself at 2 1/2 years. She also ran at 2 1/2. We would tickle her with different types of textures and rub her, helping her with her sensory processing. We would massage her. At the ECDU they would provide different types of textures for Jess to play with - she hated gooey things and had to be forced to touch them. We also put her on a vitamin supplement which I had read was good for brain development and immunity. We did not give up on Jess. We took her everywhere, exposing her to all sorts of sights and sensations. If there were too many sights and sensations Jess would shut down. We particularly saw this at the beach when she 3-4 years. The sand, wind, waves all were too much for her body to process. The first year she fell asleep, the second year I had to cover her up with the towel. Another behaviour that emerged was a comfort behaviour. She would drive a truck/car over a bump over and over again. This was seen particularly when change occurred at home e.g. Melissa and Mum were in the hospital, Mum went away to Ladies Camp for the weekend. Another behaviour which was difficult to handle, was running off. We had a few scary episodes when we lost her in the shops after she silently and quickly disappeared. In the end we tried strapping her in the pram until she started tipping the pram over, then a harness which worked sometimes unless she became stubborn and sat and screamed refusing to move, then putting her in the trolley. It was too hard to take her unless contained as she would run off...and of course she could not say her name so this was an added worry. We would also pin our phone number to her top when we went out to a park. She also had no sense of danger e.g. strangers, physical etc. so we worried a lot about keeping her safe. By the age of 4 years, Jessica was toilet trained. She was speaking in 1, 2 or 3 word groups and had said her first sentence which was 'How are you baby?' (Said at 3 1/2 years. She was talking to the baby in the sun on Teletubbies). Jess was becoming very good at using her Makaton but we noticed that as the words came, she dropped the Makaton. I was taking her to swimming lessons and she was in the mum/bub class. She loved the lessons. We kept being told by professionals that she was doing very well and was high-functioning. Nick was an even-tempered, active, happy, little boy. He loved his toy puppy Flynn, and Elmo. He also loved dressing up and playing with his big sister. It was fortunate that Nick had the same Kindy teacher as Melissa. Again she did the unit on how our faces are different. Again it worked a treat. Nick enjoyed Kindy. He was accepted well and had friends. Nick was very social. He wasn't phased by any comments or questions. The following year Nick joined Melissa at big school. It was nice to be at school with them both. Nick had his group of close friends. Any type of questioning about his eyes, was shrugged off by him. It didn't seem to bother him and still does not. He definitely has a different personality to Melissa. In Year 2 Nick sang a solo 'Sparkle and Shine' infront of the entire school in the school talent show. Nick is a very self-confident boy with a good self-esteem. He is happy with who he is and what he looks like. He has a close knit group of friends who look out for him. We noticed that Jessica's eyes were always full of gunk. Her tear ducts were not draining properly. We took her to see the eye surgeon at the Mater and surgery was organised. This was an easy procedure compared to the open heart surgery she had had previously. The doctor opened up the tear ducts and left it at that. It was day surgery and very quick. We were told that if the problems continued then further surgery would be necessary. No extra surgery was necessary. She was a strong-willed, energetic child who loved her toy puppy, horse and Strawberry Shortcake doll. We enrolled Melissa in Kindy, sitting down with her teacher explaining to her about Crouzon syndrome and what Melissa had been through. As it turned out I had taught the daughter of the teacher aid - all was good. Melissa started Kindy. She formed friendships and enjoyed going. The teacher found that the children were asking questions about Melissa's bulgy eyes, so in her wisdom, she implemented a unit on how our faces are different. It worked a treat. Melissa seemed pretty oblivious to the questions being asked and we made no deal of it. The next year Melissa progressed to Preschool. She loved Preschool - the dress ups, games, blocks, the rag doll that went home with a child each night, her friends and her teacher. Learning was fun. She was an active little girl who found it hard to sit still. The other children accepted her well. At the end of the year the preschoolers went over to the local primary school where I was teaching, for the introduction of Prep the next year. It was exciting for me to have my little girl in the school with me. Again she was oblivious to the size of her eyes and we made no deal of it. Year 1 arrived. Melissa was under the care of my dear friend, who is a Christian. She nurtured and cared for Melissa. It was a beautiful year for Melissa. Melissa was happy and had friends. She performed well academically as well. An example of this that my husband vividly remembers occurred at the hospital after Melissa had been to see the opthamologist. The boy said to Melissa, 'Why do you have big eyes?' Melissa's reply was, 'I just went to the doctor and he put drops in my eyes.' Melissa obviously meant her pupils not her eyeballs. The boy though was happy with that answer and walked away. But then Year 2 arrived and things changed. Melissa suddenly it seemed grew an awareness that she was different to the other children. And even though her teacher was supportive and vigilant, Melissa encountered some questions and comments, which she interpreted as bullying, which they weren't. She had no idea of how to respond to these questions. We then had to talk to her about her face and Crouzon syndrome. We had to teach her some strategies for when children asked her why she had big eyes. Words such as 'I was born this way...or...I have small bones in my face'... Though her actual way of dealing with other children was to run away from them. I was saddened when this happened. Melissa had been brought up by us like any other regular child. We never mentioned her eyes. To us they weren't an issue - they were part of Melissa. She hit school and the other children broke that innocence. She was not the same from that point on. Melissa started to change. In the classroom she would misbehave and seek attention. Socially she was pushy and had problems understanding social cues. This behaviour started to escalate. It needed to be addressed. She also developed a phobia to graffiti. We had been in to the city to see a circus and went to find a toilet. The toilet block was in a ghastly state and terrified Melissa. From then on she could not look at any form of graffiti without becoming anxious. Nothing we said to her would ease her stress. We talked to the speech therapist at the hospital and she contacted Child and Youth Mental Health. They worked with Melissa, dealing with her self-esteem, how to respond to questions asked by other children, how to socialise and her graffiti phobia. I am thankful for their help - we got our happy girl back again. Her behaviour improved at school. Melissa had the same teacher in Year 3. She continued to work with Melissa to help her to cope with school life, providing boundaries and support. Academically Melissa performed well. Socially she continued to encounter problems but progress was being made. At home we worked on building Melissa's self-esteem and we kept talking to her about her feelings. We took Jess home and life continued on. We now had a 'zipper' child - something in common with other heartkids. We watched Jess reach her milestones - delayed compared to most other babies - but she was progressing. From the reading we had done we knew it would be more difficult for Jess to achieve her milestones due to her low muscle tone. It was soon obvious that we had to break her milestones down into smaller steps e.g. rolling, and make her do them, over and over again, to train her brain. We had a wonderful book on gross motor skills which became our closest friend. It showed us step by step how to teach Jess how to achieve rolling, crawling, climbing etc. All the things that regular babies and toddlers just do on their own. Having the two older children was a blessing for us. Jess wanted to be with them and doing what they were doing. The day she crawled, Nick and Melissa were drawing and she wanted to be with them. They kept moving to get away from her and she kept crawling to get to them! From then on there was no stopping her. She did also crawl in her own way with one leg straight out but we worked out it was because she had trouble sitting from a crawling position, so this was another skill that we had to break down into its small parts and teach her how to do. We also started teaching her Makaton - sign language, so she could communicate with us. This was successful. We wished we had known Makaton when Melissa was little. And bouts of jealousy would bite me hard. I would look at other babies of the same age and I would feel sad. It just didn't seem to be fair. In fact the jealousy and sadness would hit so hard that I spiralled into depression. At my ladies bible study group we were talking about our upbringing and our families....this on top of lack of counselling after having Jess, led to me having a major meltdown. I immediately sought help - that afternoon infact there was an open appointment - God was already there in my situation. At the counselling sessions I had to deal with my Crouzons, growing up in my family and having brothers who were resentful of me having Crouzons, the sudden death of my dad, Jess having Downs, my visual impairment, allowing myself to be in an abusive relationship...everything really. God was good again. He gave me a wonderful caring counsellor who listened to me and helped me work through all my feelings. I knew I couldn't change my life, I didn't understand why I had this life....but I could accept that this is my life, these things happened and I could move on, choosing not to be depressed or bitter. I could choose to be happy and positive. I also went on anti-depressants. I didn't want to go on anti-depressants because of the stigma associatd with them. But as a dear friend said ... 'If you had a broken arm you would go to the doctor and get it fixed.... so if you have depression you go to the doctor and get help.' Best advice I have been given. The anti-depressants and counselling allowed me to smile again. 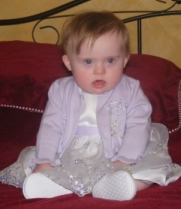 Jess was 7 months old when we took her to the Prince Charles Hospital. Walking through those doors was scary but also a relief - finally it was going to be her turn. The paperwork was done and we were taken to the ward, full of babies and children who had heart defects. Large black and white photos and stories of survivors and those who had passed away, greeted us.in the hallway. This ward was new, it was foreign, it was confronting...we did not know hearts, we knew skulls and faces... but it was also comforting as well as we knew that this was the place where she needed to be to have her broken heart fixed. We thought Jess being admitted would mean that she was to be operated on...but a doctor arrived and said that he wanted to do another echo cardiogram (ECG) to check that she was serious enough to be operated on. If she wasn't she would be sent home. My heart was in my mouth. No God was this some cruel joke? I held Jess down on the bed and held my breath at the same time whilst I watched the monitor with the flashing red and blue, not knowing what the doctor was thinking. Would they send us home after we had made it this far? The doctor declared that yes she was serious enough to be operated on! It would be happening the next door barring no emergencies which would take precedence. The morning arrived. Our two dear friends from church arrived to pray and offer support to us. I remember carrying Jess down to the operating theatre and handing her over to the nurse. Then the doors closed and we had to walk away. I actually felt at peace that God would look after her. For all of these months I had prayed that God would miraculously heal her so she would not need the surgery. This did not happen, but I really felt that Jess would be healed through the hands of expert surgeons and be safe. We saw Jess 4 hours later in PICU. She was attached to all sorts of monitors and leads, and IVs, looking so small and vulnerable. She had a large cut down the middle of her sternum. The surgeon was very pleased with how the surgery had gone. No complications. It had been a success. I was so relieved to see her. We were on the other side. I asked to see the social worker who kindly arranged a bed for me to stay in for Jess's duration in ICU and then the high dependency ward. This was an answer to prayer as the social worker said that I actually lived too close to the hospital to be eligible for the bed but as I cannot drive she saw the need for me to be there. I left Jess late that night and went back to my room and cried - all that pent up emotion came pouring out. The next morning I arrived early back in ICU to find that some of her IVs had been removed and to the announcement that she was well enough to go to the high dependency ward. This in itself was a miracle. She did have a partially collapsed lung which was a common occurrence after being on the heart/lung bypass machine but everything else was great. Up she went back to the cardiac ward into the high dependency ward. She was there for a couple of days then went back into her room. Jess needed some physio to help her lung recover but apart from that she recovered very quickly. After 9 days in the ward we went home. We saw a marked difference in Jess. Her energy levels were elevated and she was stronger.